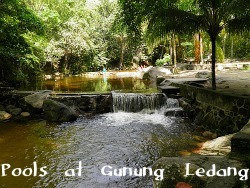 Gunung Ledang National Park lies just inside Johor's border with Melaka state, about 30 km from the town of Muar. The mountain is 1276m high (4186ft). 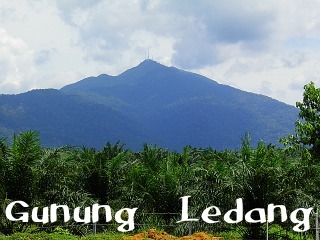 According to a sign at the entrance to the park, Gunung Ledang is Malaysia's 64th highest mountain and the 6th most difficult to climb, however, as you can see from the more detailed list on myMalaysia Mountains page, Ledang is actually only the 134th highest peak and it does not rank in the top 20 peaks in terms of difficulty. Be that as it may, it is the highest mountain in Johor stateand its accessible location, being only a couple of hours drive from both Kuala Lumpur and Singapore, means that it is one of the most popular and frequently climbed mountains in Malaysia. That does not mean that it is easy to climb. It is a 5 to 6 hour energetic hike to the summit for a reasonably fit person and there are some steep rocky faces to negotiate with the aid of ropes. Accidents happen and there have been some fatalities which is why it is compulsory to engage a guide from the Ranger's office. The most popular trail from in front of the Gunung Ledang Resort is closed for climbers until further access so when I visited recently I had to content myself with a short 20 minute trek along stone pathways and steps to the Puteri Waterfalls, a cascade of about 60m with pools and a pleasant picnic and bathing area further downstream. There are other trails to the summit, notably one from the National Park's Office about 5 km from the Gunung Ledang Resort and another from the Melaka side viaAsahan. There is also a road you can drive up almost to the summit which you access through Gate B. 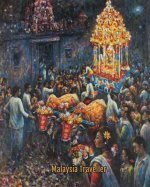 There are various legends pertaining to the mountain involving a magical princess, gold and silver deposits, the famous warrior Hang Tuah and more. It is regarded as a spiritual place. One of the reputed origins for the name Ophir is the Greek word Ofismeaning snake and some say the mountain is guarded by legions of snakes. Thankfully I did not see any snakes during my visit but I did encounter a large monitor lizardscavenging for food scraps in a litter bin. In the process he was scattering rubbish everywhere. Visitors to Gunung Ledang National Park sometimes complain about the amount of litter around but as this example shows, it is not always the humans who are responsible. Of course the park management should install animal-proof litter bins but, better still, visitors should take their rubbish home with them. For this reason, climbers have to declare all their belongings at the Ranger's office and pay a rubbish deposit of RM20, refundable after the Ranger checks the belongings at the end of the hike. Besides the monitor lizard I could see the tell-tale digging marks left by wild boars. There were also plenty of birds around, indeed 160 species of birds have been recorded here. 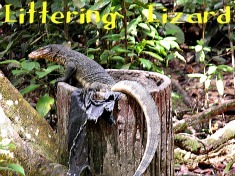 Once upon a time the wildlife at Gunung Ledang National Park was even more exotic. When Alfred Russel Wallace, the famous naturalist who discovered the boundary between the Oriental and Australian zoological regions (Wallace Line), visited Mount Ophir in 1854 he was so enchanted by the place that he spent a week there during which time he noted the presence of tigers, rhinoceros and elephants. To enter the park at the Gunung Ledang Resort entrance you have to pay RM2 per car and RM1 per person (RM0.50 for kids aged 4 - 12). To climb the mountain you need to register (RM3) and pay RM 13 per adult (Malaysians) or RM 23 (foreigners) for a Day Trip. 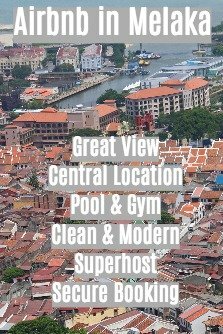 You also need to hire a guide at RM 140 per day. Other fees apply for camping. You should call in advance to book a guide and check which trails are open. Exit the North-South Expressway at Junction 235 and head to Tangkak. Just after Tangkak turn right towards Sagil on Route 23. You will see signposts for Taman Negara Gunung Ledang. Depending on which entrance you want, take either Gate B (Pintu B) or where you see a large billboard for Gunung Ledang Resort. From Gate B you will need to drive through a palm oil estate for some distance before arriving at the Rangers' Office. 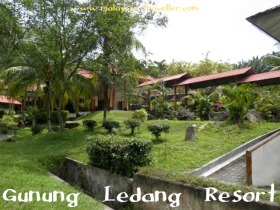 Gunung Ledang Resort is within the park boundaries. It looked OK to me but I stayed at nearby Muar.